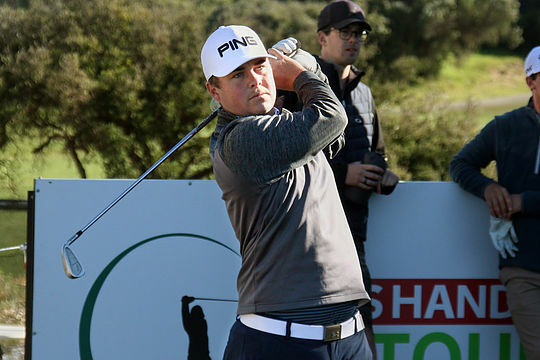 Second year PGA Trainee professional Frazer Droop has smashed the course record at RACV Cape Schanck Resort in the second round of the Victorian PGA Championship for a share of the lead alongside New Zealander Ryan Chisnall. Starting the day at 1-over the card, Droop rattled off five birdies, two eagles and a clutch bogey for his record breaking round of 8-under 62. Droop, playing in the morning field, set the second round pace at 7-under the card, taking advantage of the calmer conditions compared to Thursday’s opening round gusts. “I think around courses like this you can use the clubs in your favour if it’s not too strong,” said Droop who is a PGA Trainee at Yarrawonga Mulwala Golf Club under Head Professional and father Evan Droop. “It’s a privilege to have a course record on any course. I just kept it on the straight and narrow today and took advantage of a little less wind to get a couple of birdies and I ended up making an eagle on the 13th holing a wedge shot which got things going a bit. The eagle wasn’t the only special hole of the round; Droop had a roller coaster ride on the tough par-4 15th at RACV Cape Schanck which, under the circumstances, resulted in a spectacular bogey. “I hit it right off the tee and it bounced off a cart path then ran down the hill a little bit into the scrub so I had to take an unplayable and go back on line of sight. Joining Droop is round one leader Ryan Chisnall who playing in the afternoon field recorded 2-under 68, to maintain a share of the lead. “It was overall a pretty solid round, the wind obviously picked up a bit this afternoon which made it pretty demanding in a few areas but overall I’m extremely happy with the day,” said Chisnall. “I’ve been playing a lot of irons off the tees and I think that’s almost how you’ve got to play this course, you can kind of shoot yourself in the foot if you’re slightly aggressive. West Australian Rick Kulacz climbed to 6-under the card following his round of 4-under 66 to sit one shot behind Droop and Chisnall, he too taking plenty of irons off the tees at RACV Cape Schank Resort. “It was just a bunch of irons off the tee, I went bogey free for the first time in a while, I just got it in the fairway, got it onto the greens and tried not to make big mistakes,” said Kulacz. “It’s just a matter of getting your ball into play this week, you can rack up pretty big numbers with loose swings. I’ve been hitting 2-iron off most of the tees, even some of the par-5s and if I can get home in two I’ll lay it up and pitch it close. Following a round of 4-under 66, Victorian Ben Ford played himself into fourth place outright at 5-under the card. Aaron Pike was also big mover in round two shooting 5-under 65 this morning to climb to 4-under the card. He is joined tied fifth on the leaderboard by Adam Burdett. In the Victorian PGA Championship Celebrity Challenge event, Maverick Antcliff and Danny Lovell are leading at 18-under with Droop and Lukas Michel just behind at 17-under. Josh Younger and Campbell Neal are tied with the team of Daniel Gale and Ozkan Sahin at 14-under. Happy to be playing the weekend are Keith Schleiger and David Zaharakis with their playing partners Cameron John and Ben Ford respectively. The cut was made at 5-over the card with 58 professionals and two amateurs making the weekend rounds.